The Union Ministry of New & Renewable Energy (MNRE) has agreed to include Punjab in the ambitious “Green Corridor Mission” project on the request of Punjab New and Renewable Energy minister Bikram Singh Majithia here today. Punjab will now be in line to receive funds for further strengthening of its transmission and distribution infrastructure to ensure efficient evacuation of solar power to the central grid. Besides this, the Union Ministry has also announced a major roof top solar power pilot project to demonstrate as well as encourage people to set their own solar power roof top projects to successfully implement the Net Metering policy of the state. 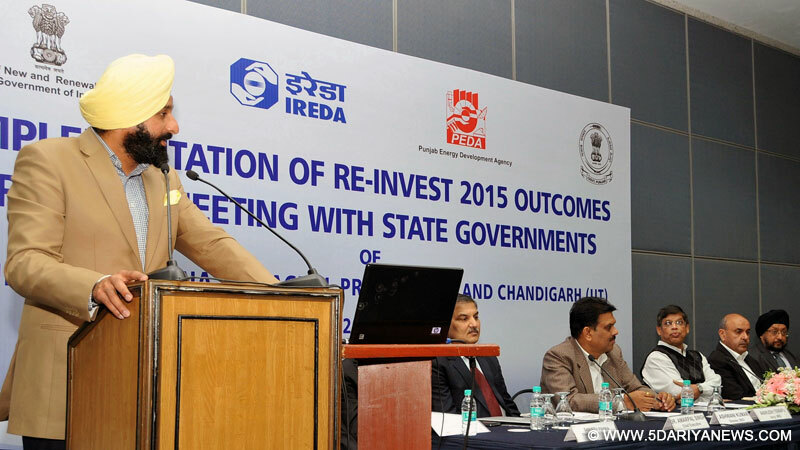 These decisions were conveyed here today by Mr. Upendra Tripathy, Secretary, MNRE at the first regional meet held at CII under the Chairmanship of Punjab New & Renewable Energy Minister Mr. Bikram Singh Majithia for implementation of RE-INVEST Conclave-2015.Addressing this regional meeting of states like Punjab, Haryana, Himachal Pradesh, Jammu & Kashmir and UT Chandigarh, Mr. Majithia said the recently held RE-INVEST-2015 Summit has given a new dimension to the entire renewable energy mission as the Prime Minister had set the ball rolling by throwing a gigantic challenge of 270 GW power productions from renewable sources. He underlined the need for joining of hands by Union Government, State governments and banks to thrash whittle down impediments if any in achieving this goal. He said Punjab being a land locked faced several challenges in providing land to prospective solar investors. He said the state had however risen to the challenge and taken an initiative to provide government approved land on lease policy to facilitate investors besides offering power purchase agreements (PPA) with the state utility. He said after the successful implementation of 240 MW solar power projects in the state; Punjab has taken a major initiative by offering 65 MW rooftop solar power projects in a single bid. He said the state had the world’s biggest single rooftop project of 7.5 MW in Dera Beas and that it was being further upgraded to 31.5 MW in next few months. Majithia said Punjab had also started a unique net metering policy to encourage residents to install rooftop solar projects for domestic use selling power to the State grid. He said Punjab had also decided in principle to waive off wheeling charges for power produced from renewable resources and a cabinet nod would be taken soon for this purpose. The Minister further said that for realization of 270 GW power from renewable sources we have to harness the potential of all sources like solar, biomass, wind and hydro. He also emphasized the need to focus on the key areas of biomass, bio ethanol and bio CNG as in an agrarian state like Punjab there was an annual agri residue availability of 21 million tonnes. He said that it had becomes imperative to harness the abundant potential of production of power from biomass to save the ecology as well as ensure additional income to the farmers. Inviting the all major as well as small players of renewable energy sector, Mr. Majithia said that the state government was always open to their suggestions and won’t hesitate to walk extra mile to make the state a hub of clean and green energy. Earlier, Mr. Upendra Tripathi, Secretary MNRE appreciated the Punjab government’s initiatives in solar, biomass, rooftop power sectors and expressed hope that it would also lead the nation in rooftop sector. He said that there was a paradigm shift in human thinking regarding renewable energy which was a welcome sign and hoped that the nation would achieve its target to enhance present 6% renewable energy production of total electricity production in the country to 20% by 2020. He said that the success of renewable energy projects depends on the credit support and the Union government was working with various financial institutions to more liberal availability of finances for such projects. Earlier, Mr. Anirudh Tiwari, Secretary, Power and New and Renewable Energy while welcoming the investors said that renewable energy sector was a great opportunity for banks as these had assured resources as well as assured selling of power that to with state utilities. He also urged the neighboring states to pool in their resources for realizing the dream of clean and green energy. He also said that the success of renewable energy projects depends on the affordability of required equipments and our state has most attractive friendly policy for this purpose. Later Mr. Tiwari made a detailed presentation before investors.Mr. Amarpal Singh, CEO, PEDA and Mr. Balour Singh, Director , PEDA was also present in the meeting.